Never happened that to me, the only strange thing that happened was some texture problems but when i left the planet and came back, everything was fine. You can try that and see if it works. Did you land back at your base? you have to orbit the planet and find your base and land either there or close to it. a little home icon will appear above the landing zone your home is in. After revisiting my first base, I had found most of my stuff intact, however I definitely missed my vehicle and probably some of my resources. As for my vehicle, after this during the space travel screen I can see 2 vehicles (with it's markers) in the space and some tiny thing around the one which I believe is my truck. decided it's easier to just make a video of the weird vehicle physics. i know it's a known issue, but just to contribute my part. So while out roaming, I managed, again, to flip the rover after a nasty bounce over rocks (danged rocks!) Game default is to toss you from the vehicle, which it did, but I find myself (it happened more than once) swimming in the terrain, very scared I'm going to lose the goodies I have on me. 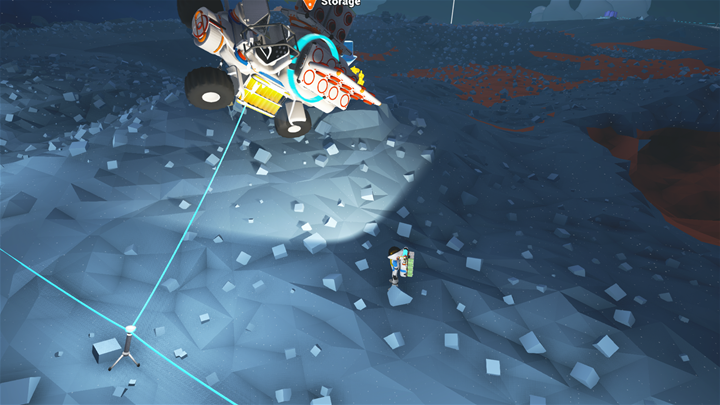 I managed each time to get close enough to the rover to tab into it, but that seemed to be the only way to get back to normal. It's minor, but will need rectifying. So it seems to be the habitat, as it just happened in another game. Whenever you load up a saved game that has a habitat attached to a vehicle, it thinks that it's been placed, so adds the semisphere of black ground beneath it. Since it's not actually attached to the ground, this makes it clip with the vehicle, and spin uncontrollably, either into the ground (for my second one), or into space (for my first). 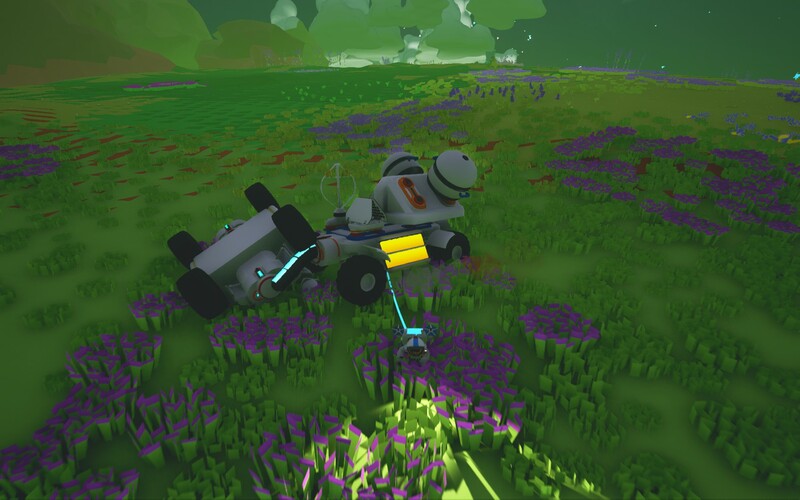 Built the Truck then put the large storage from the vehicle bay on it and tried to attach research projects which caused the truck to start glitching into the ground. I have had this happen on xbox 1 as well with research items from the trees. It will render the truck immobile. if just one research item, the truck reacts as if that there is a massive force acting upon that side. If 2 are placed on, some force would be negated. In theory, if the storage bay was vertical with the attachment nodes on the horizontal faces, 2 research units would completely cancel each other out completely. When playing multiplayer the host player can set down the tethers but other players I have found from playing each time cannot set down any tethers. Players can still create items and help out the host player but for some reason the game won't allow them to set down the tethers. I have also found if you die and respawn at the capsule you fall through the map and die. Even with these issues that I have found the game has me completely hooked and I can see that'll keep me playing even into the future. Can't wait to see what y'all have planned for the game. Oh yea I forgot to mention this is on Xbox one!! Problem is known... should be patched this Week. Gameplay, when trying to place research onto a large storage, the truck trailer becomes wonky, and jitters all over the place. Placing 2 on either side to distribute the weight appears to alleviate some of the force by picking up and placing again, however if you getting lucky and the jitters stop, it will not move (towed). Place a research on a truck that is being towed. Happens all the time. Workaround is using the winch to drag it behind you. In the pictures the drive truck was flipped by the trailer spazzing out. So on spawning in I decided to hop in my buggy and explore , but after getting out, when I tried to get back in, the buggy would flip upside down and eject me usually under the ground. Once so deep I discovered caves below me, before I hit the bottom and died. So I tried to make a new buggy and see if that helped but that buggy was also buggy... . So I restarted and now both buggy's work fine ,but I have no Idea why that happened. On a brighter note whatever you guys fixed in the last patch helped my FPS immensely! So good work and keep it up ! Fun game so far! Have you downloaded the latest patch? For me these issues have stopped completely, since downloading it. When driving the truck if I bumped into a rock on the surface one of the wheels would clip inside of the truck and cause it to be uncontrollable for a minute or two. On XBone, during the vehicle framedrop I jumped out. After waiting a few minutes for the truck to settle down it took flight instead. Flew a good distance frame by frame and then crashed on the other side of my base. Love how the little guy watches it fly away with a look of disappointment on his helmet. Using the [Default 0.2.93.0] not the Beta branch. I spent all that time getting the ore to finally build the legendary crane with a drill on my truck and it was an Absolute waste of time! The crane and drill looks neat but it's a waste of materials. It's better to just throw a seat, a large battery on the front and a second large battery next to the 1 seat, and a storage on the back (its called storage when you research it, which i honestly thought was the same thing that you already get but it's for vehicles). That storage should be renamed to vehicle/truck storage. Once again, the crane/drill combination seems absolutely useless compared to the tool you start out with for sucking up materials. I had this happen on PC, after putting a second research item on it. When I tried to put 2 or 3 on the truck storage upgrade, the truck would sometimes flip around in the air, fly around randomly, and caused me to fall through the earth and die. It let me load 1 and drive it okay, but once I tried to get out of the vehicle, the truck started moving strangely by itself again. Edit: I think what above poster said about the type of item is probably correct. It wasn't just that it was the 2nd, it was the specific second item. I can't load the 2nd research item, even by itself. It's a shame. The reason I made the expansion bay is to carry more research items, and it's not removable. In multiplayer I am sure that's the whole point. But yeah my game save is corrupted now after the tether on the truck glitched out ? Went up into space in shuttle visited a barren moon then another planet. 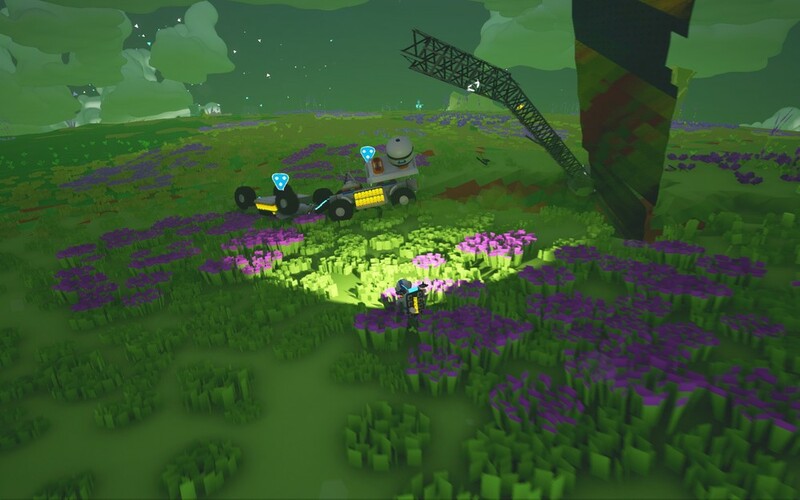 When i arrived back at home planet base my truck had dissapeared completely.